The 9MM pistol, ammunition and marijuana that police said they found at the ‘E’ Field, South Sophia home of a couple. 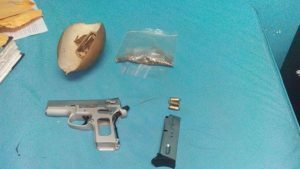 A mason and his wife Saturday night remained in police custody in connection with the discovery of a gun, ammunition and marijuana at their Sophia, Greater Georgetown home. Police said the 33-year old man and his 32-year old spouse were arrested Friday night at about 11:30 after police received certain information and searched a house at ‘E’ Field, South Sophia. There, police alleged that the found an unlicensed 9MM Wesson pistol with three live matching rounds. Twelve grammes of suspected marijuana were also seized from the house by lawmen.